There is a lot of debate surrounding the Cleveland Browns and their No.3 selection in next month's NFL Draft. Should they solidify their offensive line and select Wisconsin left tackle Joe Thomas? Might the team give up on quarterback Charlie Frye after just two seasons and select LSU standout JaMarcus Russell or Notre Dame's Brady Quinn? Could the Browns bolster their receiving corps by selecting the incredible wideout from Georgia Tech, Calvin Johnson? And one cannot forget the ever popular “trade down" option. The truth is that all of the above would make sense on some level. However on April 28th, the Browns need to select Oklahoma running back Adrian Peterson with their first round pick. Period. If they don't, Cleveland will regret the decision for years. In 2006, the Browns' rushing attack was woeful. Starting tailback Reuben Droughns averaged just 3.4 yards per carry and managed only 4 touchdowns all season long. To put that into even more context, Charlie Frye rushed for three 3 touchdowns last season. Many will point to the fact that Cleveland's offensive line was porous at best, and that this led to defenses stacking the box and plugging running lanes. In 2005, though, Droughns averaged 4.0 yards per carry and rushed for 1,232 yards. Although that was a breakout season for a Browns running back since 1985, Droughns still only had 2 touchdowns that season. The addition of Adrian Peterson will add a home run threat not seen in Cleveland for quite some time. In a city known for great running backs such as Jim Brown, Leroy Kelly, and Earnest Byner, it's a shame that the Browns faithful have been reduced to witnessing the likes of William Green, James Jackson, and Jamel White. 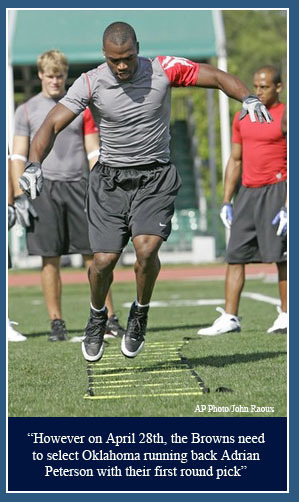 Adrian Peterson is a back with great vision, speed, and power. He also has the ability to pick up the blitz and protect the quarterback. If the Browns choose to stick with Charlie Frye, a running back of Peterson's skill set will help keep opposing defenses honest. Peterson's abilities will also open up the field for the likes of Kellen Winslow and Braylon Edwards. Peterson will not come without concerns, however. In 2004, Adrian Peterson rushed for 1,925 yards which set an NCAA Division I freshmen record. In 2005 and 2006, however, Peterson was hampered by a rash of injuries that slowed his production on the field, and raised questions about his durability. In his sophomore year, Peterson sat on the sidelines for all or portions of 4 games due to an ankle injury. In 2006, he missed 6 games due to a broken collarbone he suffered on a celebratory dive into the end zone. Although Peterson missed game time in his last two college seasons, one cannot deny the fact that he has a nose for the end zone. In just three seasons at Oklahoma, Peterson rushed for 41 touchdowns. The Cleveland Browns need that type of production from their backfield. Peterson's talent should bypass any concern regarding his injury history. Ironically, the Browns’ organization has been snake bitten with injuries to their star players. Defensive end Courtney Brown was rarely injured while playing at Penn State. Yet since being selected No.1 overall in 2000 by Cleveland, he has had countless knee injuries and is now contemplating retirement. Who would have foreseen Kellen Winslow breaking his right fibula in his second NFL game in 2004, and then being involved in a motorcycle accident that would cost him all of 2005? A year later, no one would have suspected the Browns’ prize free agent acquisition and Cleveland native LeCharles Bentley would tear his patellar tendon on the first day of practice with the team. Who could have forecasted that cornerback Gary Baxter would tear both his patellar tendons on one play in 2006, thus ending his season and putting his career in doubt. Injuries happen, and are a part of the game. Nevertheless you cannot pass on a great player because of the fear of what could happen. Frank Gore, the starting running back of the San Francisco 49ers, tore the ACL in both his knees during his career at the University of Miami. Gore is now a Pro Bowl running back in the NFL. Willis McGahee, also a Miami Hurricane alumnus, blew out his knee in the National Championship game in 2002 against Ohio State. McGahee, though, ended up not only being a first round draft pick that same year, but has gone on to have success in the NFL. Peterson's injuries, compared to those listed above, are relatively minor. Many pundits have stated that with the recent signing of former Ravens’ running back Jamal Lewis, the Browns no longer should seek a running back with their first round pick. That's nonsense. Jamal Lewis is still relatively young, but he has not been the same running back since his short stint in prison during the spring of 2005. Before being sentenced to a four month prison term for allegedly setting up a cocaine deal with his cell phone, Lewis rushed for 2,066 yards in 2003. In 2004, he eclipsed 1,000 yards, and had a 4.3 yards per carry average. In 2005, though, Lewis' yards per carry average dropped to 3.4. In 2006, it increased but only to 3.6 yards per carry. In 2007, Jamal Lewis will be entering his eighth year in the NFL. That is a lot of mileage for a running back, especially one with a bruising rushing style. Lewis does not have many good years left, and on top of this, he signed just a one-year contract with the Browns. This signing very much opens the door for a talent like Peterson, and it should. In 2006, the NFL saw successful teams thrive with a two back system. The two Super bowl teams, Indianapolis and Chicago, both used two running backs to get them to the Championship game. The New Orleans Saints, who already had a proven running back in Deuce McAllister, still selected Reggie Bush with the No.2 overall selection in last year’s NFL Draft. It was not a need pick. The Saints simply could not pass on the talent of a player like Reggie Bush. The Browns cannot afford to bypass Adrian Peterson. Simply put, Cleveland needs to start winning now. Coming off a 4-12 year, and having had just one winning season since 1999, the Browns need players that will have an impact from Day one. Not players that need to be developed. As tempting as it is to select a potential "franchise quarterback" with the third selection in next month's draft, the Browns should not give up on Charlie Frye. Or Derek Anderson for that matter. With a competent rushing attack, the Browns don't need a superstar at quarterback. Ask Rex Grossman, who rode the Bears strong defense and premiere rushing attack all the way to the Super bowl. The NFL Draft is a crapshoot. There's no question about it. However when drafting in the first round, especially in the top ten, teams must select the best player available. In 2001, the Cleveland Browns made the mistake of passing on LaDainian Tomlinson in favor of Gerard Warren because Warren seemed to fill a bigger "need." Hopefully next month, the Browns won't make the same mistake twice.